You are currently browsing the archives for the my morning jacket category. The hoo-har over the new My Morning Jacket album, Evil Urges, seems to have had a negative effect on the band’s concert audiences, if this gig is anything to go by. When the band played this same venue a couple of years ago in support of their Z album, it was pretty much full. Last Friday night there were noticeable gaps in the crowd, with some people no doubt put off by the new album’s dalliance with disco, funk and boyband soul. Well, it’s their loss, because My Morning Jacket are still one of the greatest live bands around at the moment, a fact that they effortlessly proved last Friday night. Admittedly, I was pretty unimpressed with Evil Urges when I first heard it but I stuck it out and by about the fifth listen I was hooked. I remember the same thing happening with Z and that is now one of my favourite albums of this century so far. The new material certainly adds variety to the MMJ live set; for the most part the songs are shorter than the average without much in the way of guitar solos. Shorn of their studio sheen, they’re a little ragged around the edges, which is exactly what they need. The title track opened proceedings with Jim James belting out his Prince-ly falsetto, which he did to better effect later on in “Highly Suspicious”, though Carl Broemel’s hilariously deadpan backing vocals at the other end of the range stole the show. Even better were the studied James Taylorisms of “Sec Walkin”, though “Thank You Too!” still managed to sound like the schmaltzy boy band anthem that it is on record – if Westlife get their hands on it it will be massive. As you would expect, the more straightforward rockers from the album, “I’m Amazed” and “Remnants”, shone and I’m sure they’ll be staples of the band’s live set in the years to come. For the encore the band upped the ante even further, bringing out the big guns like “Dondante”, “Mahgeetah” and perennial crowd favourite “One Big Holiday”, which closed the show. The crowd, which had become more and more animated as the gig wore on, were positively ecstatic by the end. Not only are My Morning Jacket a great live band but they have a canny knack of bettering their previous performances each time we see them. Roll on T In The Park. 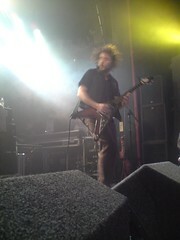 File under Gig Reviews,manchester academy 2,mp3,my morning jacket,Reviews.